Nonna’s Pasta & Pizzeria is an Italian restaurant that offers freshly made artisanal pizza and pasta dishes. 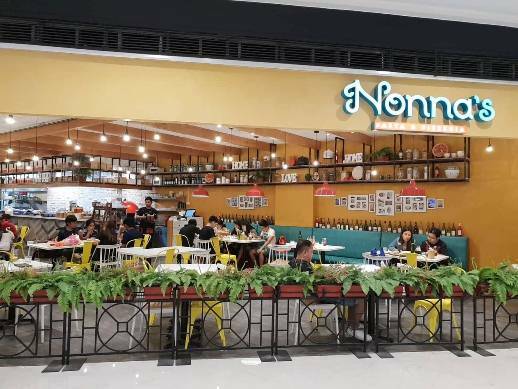 They have recently opened a branch at Robinsons Galleria, but it was only early this month that we were able to try it. We love their colorful and well-lit interior! I guess this is also one of the reasons why this restaurant is never without diners. This thin-crust 4-Formaggi pizza was super soft that we needed to hold each slice with both hands. It actually has five, not four, types of cheese in it: mozzarella, Gouda, honey goat cheese, parmesan and blue cheese. Yummy! Seafood al Nero is squid ink pasta with fresh seafood (clams, mussels, shrimps and squids) in rose sauce. Rose sauce is a combination of Pomodoro and Alfredo sauces. Hubby had it all to himself with nothing left on the plate saved for a tiny amount of sauce. From an observer’s point of view, this pasta dish seemed delectable. A very simple pasta dish but quite delightful, this Spaghetti Aglio Olio consists of spaghetti, garlic, parsley, parmesan cheese, chili and olive oil. My son and I shared a serving of this, and the plate was swiped clean. The spaghetti was also chewy and firm. Overall, the food at Nonna’s Pasta & Pizzeria was satisfactory and quite affordable. This entry was posted in Italian Cuisine, Nonna’s Pasta & Pizzeria, Robinsons Galleria. Bookmark the permalink.